Are these what Google's Nexus smartwatches will look like? We recently reported that Google may be working on making its own Android Wear smartwatches. Today, we have rendered images of what those Nexus watches could look like. An unnamed source told Android Police about the company's plans, and the site recreated its own rendered images from the physical description provided by their source. Android Police is fairly confident about its renders, but notes Google is still in the prototyping stage, which means the real watches could look dramatically different. Looking at the renders, you can see the watches look pretty standard, although the larger model, codenamed Angelfish, sports two extra buttons. It's unclear what these two buttons do, but they could be customizable to launch apps and settings. It also looks to be sportier than its smaller sibling, codenamed Swordfish, and its fitness-focused watchface reiterates that. Speaking of watch faces, the renders show off a new face for Android Wear, allowing users to customize what data they want to see at a glance. The larger watch is separated into eight parts with different information about calendar invites, steps, emails and much more. The smaller watch only includes four customizable quadrants and may be targeted toward the more casual wearer who doesn't need the fitness features of the larger watch. Although Android Police didn't render images of the watches' side profiles, they do mention Angelfish is substantially thicker than Swordfish. That's not surprising as Angelfish will pack in LTE and GPS, while Swordfish won't. 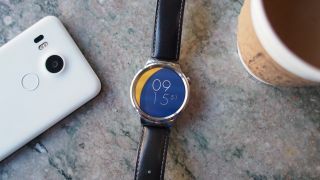 Additionally, Swordfish will apparently work with Google's MODE watch bands, which feature a quick release mechanism to make strap changes a breeze. Angelfish, meanwhile, won't. In addition to these Android Wear watches, Google is rumored to be releasing new HTC-built Nexus phones soon. Google's phones and smartwatches should share similar aesthetics, and it would be smart if the company released them together, or even in a discounted package.